It weighs about 310 grams. Normally it's about 13cms long and at its widest point about 9 cms across. It is somewhat pear shaped, about the size of your fist. The colour is reddy-brown. It is a hard working four-chambered pump. The Bible has a good deal to say about the heart but it rarely speaks of the heart beating in our chest. 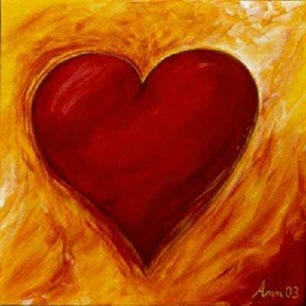 The heart is the core and centre of everything we think, feel and act. According the biblical writers the heart is the source of our emotions, our intellect, the will and our moral life. The heart, as the Bible writers often say, questions, understands, meditates, plans, believes and trusts. It is the evil heart that plans and thinks and acts bad things. God says, "In your hearts do not think evil of each other" (Zech 7.10). In the New Testament Paul says Christ rules in the heart through faith (Eph 3:17). The heart for the Bible writers is a person’s whole character and personality and it is to the heart that God speaks and reveals his will. God says in Jeremiah, "I will give them a heart to know me, that I am the Lord" (Jer 24.7). This heart disease is evident in the way we find it difficult to go to a person with whom we have a difference and to make amends. You and I know all too well how our proud hearts will not let us understand, sympathise, seek out the person who has offended us and to show love. Our hearts so easily become hard hearts – cold hearts - as we harbour grudges, self-righteousness and an unwillingness to admit our own faults. Jesus summed it up like this, "Out of the heart come evil thoughts, murder, adultery, sexual immorality, theft, false testimony, slander" (Matthew 15:19). Heart disease is a fact. The other name for this heart disease is "sin". It’s part of our lives. Even though we are regular members of this congregation, we are not immune to this heart disease. It can attack us at any moment. In fact, it seems to strike members of the church with a particular vengeance. Satan loves to set one Christian against another. He loves it when Christians foster a hard heart against their fellow Christians and take every opportunity to sting the other with hard words and unkind actions. Believe me when I say that over the past 30 plus years in the ministry I have witnessed how hard and cruel one Christian can be against another. I have witnessed it in myself. This disease is not cured by surgery, or artificial valves or bypasses. Spiritual rebirth is not produced with instruments. After the prophet Nathan had pointed out David’s sin of covetousness, murder and adultery, David prays, "Create in me a clean heart, O God. Renew a right spirit within me" (Psalm 51:10). God said to Ezekiel, "I will give you a new heart and put a new spirit in you; I will remove your heart of stone and give you a heart of flesh" (36:25). God says, "Any kind of do-it-yourself fix will not get to the very bottom of the cause of what ails our heart. What people need is a new heart, a new character and personality: new thoughts, feelings, ways of looking at things, new ways of doing things". This is what Paul is getting at in his second letter to the Corinthians when he said, "We recognize that one man died for everyone, which means that they all share in his death. … Anyone who is joined to Christ is a new being; the old is gone, the new has come. There are those who experience the sinfulness of their fellow Christians and leave the church because they didn’t expect to see such things in the church. People in the church sin and not for one minute does Jesus say that is reason enough to turn our backs on our fellow Christians, walk away and refuse to be friends again. By doing that we are just adding our own hard heartedness to the situation. Paul very bluntly says, "Do not make God's Holy Spirit sad" (Eph 4:30) but that’s exactly what happens when we allow our own hearts to be ruled by sin. When God gives us a new heart we mess it up with sin and so every day we need to undergo a heart transplant. Daily we sin, every day we repent, turn to Jesus and are made new and clean again. We join with David, God's chosen servant, acknowledging our sinfulness, repenting and praying, "Create in me a clean heart, O God". We receive forgiveness and salvation through Jesus’ own words, through baptism and Holy Communion. We are forgiven. The guilt of our sin has been wiped away. We have been made clean. We have been adopted into God's family and so now as God's children our lives reflect that we belong to God, that we have new hearts that are keen to do the will of God. God says to us through the prophet Ezekiel, "I will give you a new heart … I will put my Spirit in you and move you to follow my decrees … You will be my people and I will be your God."